This is based on a recipe I found in MS Living Magazine. I one and a halved that recipe. I also added rainbow chard from the garden and red onions. These both added color and some sweetness. Instead of smoked Gouda (which would have also been wonderful) I used a high quality white Cheddar Tickler which had red onion in it (yum!) The key to this recipe is to be careful not to overcook the brussels sprouts. It is a three part recipe. The bechamel which is a basic white sauce, the sprouts, and the assembly. It is a great holiday side. Preheat oven to 375. Make the bechamel: Melt butter in a saucepan over medium heat. Add flour, and whisk until mixture bubbles slightly but has not started to brown, about 2 minutes. Gradually whisk in milk. Raise heat to medium-high, and bring to a boil, whisking often. rEduce heat to low, and cook stirring occasionally with a wooden spoon, until thickened, 12 to 15 minutes. SEason with salt and FGP. Remove from heat. Add 1 cup cheese and stir until melted. Meanwhile, blanch the brussels sprouts: Bring a medium pot of salted water to a boil. Cook Brussels sprouts until just tender when pierced with the tip of a paring knife, 3 to 4 minutes (I would err on the 3 minute side just to be safe). Drain, and transfer to an 8 cup (8 by 12) baking dish. Toss with chard and onion (uncooked). Assemble the gratin: Pour bechamel over Brussels sprout mixture and sprinkle with remaining cup of cheese. Bake, uncovered, until bubbling and golden, about 25 minutes. Serves 8. Sugar Snap Peas, the best winter treat. Dahlias and Coleus bringing cheer to the front porch. I've also got broccoli, cabbage, radish, mixed baby greens, carrots, and spring onions getting a good start. Late summer planting is so much easier. The autumn here brings regular rainfall but still plenty of warmth to encourage quick growth (which means beating the frost in December). Hands off is just what I need right now. I make another version of this without onion which is just as good and has red pepper flakes in it. In this version the onion plays as important a role as the tomato. I tried it with and without garlic and I, surprisingly liked the version without. Which is crazy because I am a garlic maniac and always double this ingredient in every recipe. Somehow, without the garlic the sweetness of the onion can really shine. Puree your onion very well so it becomes a well-incorporated part of the sauce. This was really good over those wide tender Paparadelle noodles, but I served it with Gnocchi at our Back to School Dinner adding capers to the sauce, and it was just as good. Versatility makes me happy. Puree the onion in a food processor until smooth, set aside. Puree the tomato in food processor until smooth, set aside. Heat olive oil over medium heat in a skillet. Add the onions and cook until soft and translucent, about 3 minutes. Add the tomato puree. This will be quite runny and requires about 15 minutes of cooking to reduce the liquid. 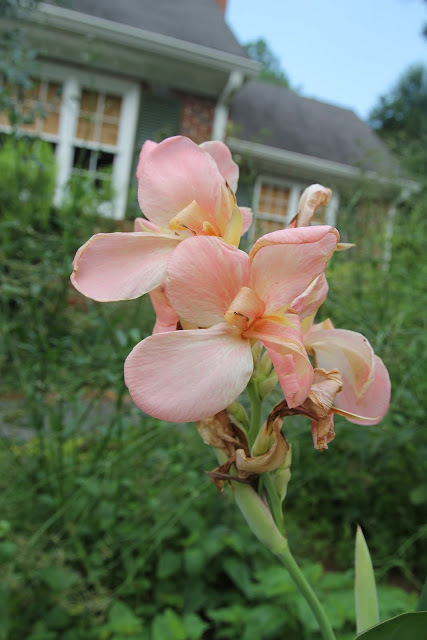 But, watch it because you don't want to reduce it so much that is becomes dry (see photos above). Take off the heat and season with salt and fresh ground pepper and stir in cream (this is also just as tasty without the cream). Toss with pasta, sprinkle with chopped parsley and serve. Serves 4. I just harvested the first eggplant from our vegetable garden. This is a great way to use up these creamy, hearty vegetables. And, the only thing better than fresh mozzarella is melted fresh mozzarella! Preheat oven to 400 degrees. 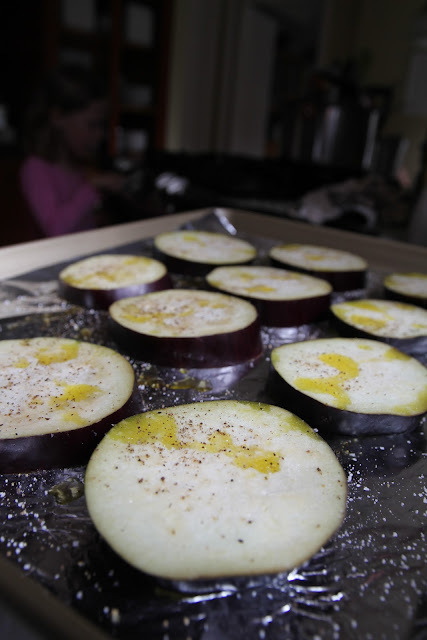 Line baking sheet with foil, place eggplant slices in a single layer on foil. Drizzle eggplant with olive oil and sprinkle with salt and pepper, flip and repeat on the other side. Spoon about 1 tablespoon of pizza sauce on eggplant, top with mozzarella slices and bake in oven until cheese begins to bubble, about 20 minutes. Serve hot over sliced of toasted baguette rubbed with raw garlic or a bowl of steaming pasta tossed with lemon juice and olive oil, or just on their own with a fork! !